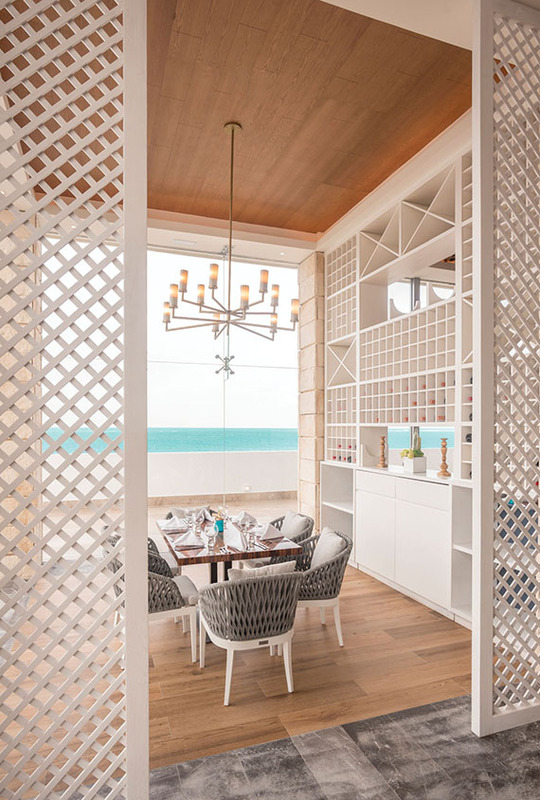 At Cancun’s newest resort, the Haven Riviera Cancun, the magic is in the details. There’s nothing ostentatious about the design of this resort. After a 15-minute drive from the airport, past a jungle of mangroves, visitors emerge to an expansive, sleekly designed property that is minimalist in feel but definitely not in offerings. Guests arrive at the lofty-ceilinged, open-air lobby, which has views directly to the sea in front. Two grand staircases lead down from the main building to a central pool. Facing the sea to the right is another extension of the resort built around a massive, circular, tranquil pool dotted with cabanas and daybeds. Details are muted, with whites and earth tones — the pops of color coming from the jungle and sea. 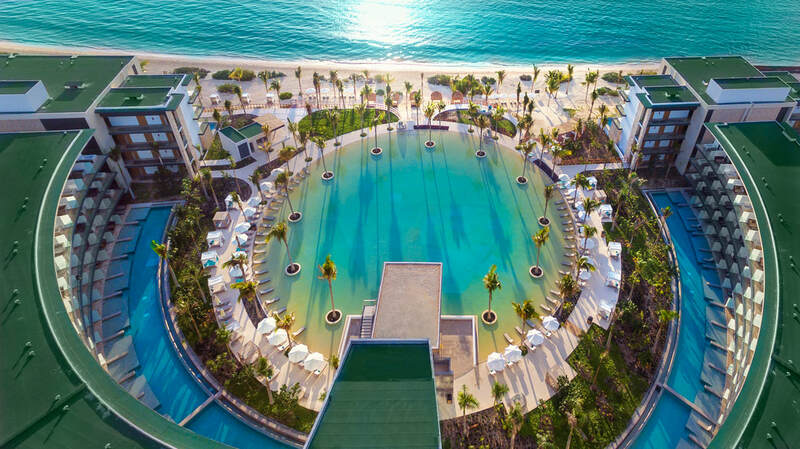 The 333-room, all-inclusive resort is majority oceanview. For the Haven, which bills itself as providing an “all-exclusive experience,” it’s the service details that set the bar. Eighty-eight rooms are swim-out suites, and each room offers personalized aromatherapy, a personalized minibar and personalized pillows. Guests can opt to elevate their stay by booking one of the Serenity Club rooms. These oceanfront rooms have butler service, a daily a la carte breakfast option served overlooking the ocean or pool, an invitation-only manager’s cocktail reception and special VIP surprises served daily. Olios restaurant at the Haven serves Mediterranean fare in a tranquil setting. Facilities include six restaurants; three snack bars; nine bars, including two swim-up bars; and a full-service spa. I visited in October, before its official opening the following month, so there were a few services that were still unavailable. Still, it was easy to see what the resort was trying to create. The dining highlight is Agua Bendita, which is a combination of traditional Mexican cuisine with classic steakhouse fare. It is here that the “all-exclusive” concept really made its presence known. Juicy tomahawk steaks, authentic Mexican dishes, tortillas made by hand and an impressive wine and cocktail list are all included in the room rate. The fare at Olios, the Mediterranean restaurant, was equally fresh and delicious. We did not have the opportunity to try Flavours, which is the all-day dining venue, but we did tour the space. Sprawling on the ground floor, the buffet-style restaurant will include local cuisine as well as international fare, including seafood, meats, veggies, pastries, fruits, cheeses and desserts. Other food options include Satsu for Asian fusion, Vora Mar for grilled seafood, the Vistas snack bar and a coffee shop. There is also Limes, an American-style bar, and Havens Lounge for daytime drinks and relaxing. Moons, the Las Vegas-style club, was not open at the time of our visit, but it is designed to be the spot for after-dinner drinks and late night cabaret. Rates at Haven begin at $465. Visit www.havenresorts.com.